Creating a plant-based, meatless meal plan doesn’t have to be challenging. The options are at your fingertips… literally. There are tons of websites that feature delicious vegetarian and vegan meals that fit a variety of tastes. If you are Pinterest user, you can quickly review tons of plant-based and meatless recipes that have been pinned hundreds or thousands of times. Tip: Look for sites that provide the calorie and nutrient details for their recipes. If you find a recipe you love, but no nutrition information is posted for it, don’t fret. Plug the ingredients into a nutrition calculator. These calculators will also help you to substitute specific ingredients. For example: You may want to try a smoothie recipe, but it calls for a protein powder that you don’t use. You can enter in the ingredients into the calculator with your protein powder instead and get the nutrition details for that unique mix. 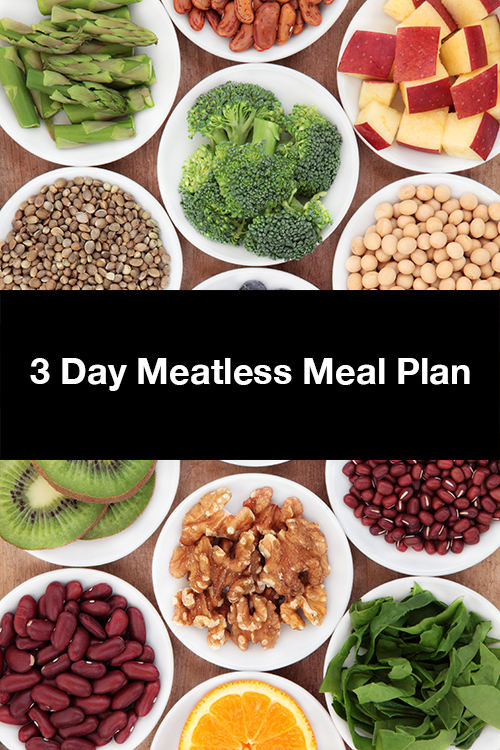 Here is a sample 3 Day Meal Plan that we put together from recipes online to serve as an example of how delicious meatless eating can be. Each day of meals is just a little over 1400 calories.